Active24 Review 2019: Is Active24 a Good Hosting? Active 24 is a Czech based web hosting company with over 100,000 customers. They mostly cater to clients around Western Europe and have been in the market since 1996. Active 24 is a Czech hosting company that was established in 1996. As one of the pioneers in the field of web hosting, they’ve done a great job of keeping up with technological developments. They currently serve over 100,000 clients across the Czech Republic, Spain, Germany, the Netherlands, and the U.K. Active 24 offers shared and managed VPS hosting solutions, with your choice of Windows or Linux as an operating system. E-commerce website owners also have the option of their specialized WooCommerce or fully-featured e-Shop packages. This package really cuts out all the fluff though. It doesn’t include any MySQL databases, support for any scripting languages, or any automatic installations of the popular CMSes such as WordPress, Joomla!, Drupal, and WooCommerce. (That’s not to say that it precludes manual installations, fortunately.) Of course, this is their cheapest package, so it’s likely meant for those who simply want a basic online presence. Automatic installations of popular CMSes like WordPress and Joomla! As with the Start package, this is capped at one domain per account. This plan gives you solid value for money — you’d be hard-pressed to find those resources and features at that price range with any other host. If you need to set up multiple websites, you can go for their Firm or Expert packages, which allow you five and 10 domains per account respectively. All shared hosting accounts come with the industry-standard 99.9% uptime guarantee. If you’re going for their managed VPS hosting packages, they come with a 99.93% uptime guarantee. If you’re a beginner to website creation, you might want to consider subscribing to Active 24’s website builder plan. The Premium package gives you access to over 220 mobile-friendly templates, 5GB space, 1GB email storage, and over 400000 stock photos. You can even publish a Facebook page and edit CSS styles via the website builder. This service enables you to get a website up and running without having to hire professional designers or programmers. Overall, Active 24’s prices are highly affordable, which explains why they’re so popular in Europe. A unique advantage Active 24 offers is that when you choose to migrate to their service from a different provider, they’ll double your chosen contract length for free. This means that if you move your existing domain to their servers and pay for a year in advance, within 14 days they’ll credit a second year of hosting to your account at no extra cost. However, this only applies to their shared hosting packages, and you’ll have to subscribe to their service for at least six months to get the bonus. 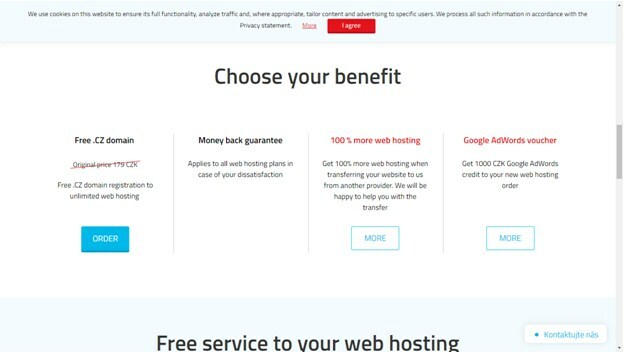 Active 24 offers a 14-day money back guarantee on their shared hosting packages. This might feel a bit stingy, but bear in mind that they also offer limited free trials of almost all their services. Support is available via live chat, email, and telephone. They also have a German help desk open during business hours on weekdays. Since they’re based in Prague, all of their technical documentation is written in the Czech language. This may prove tricky for non-Czech customers. However, when I contacted their customer support, I found that they could communicate in English, so it might not be as much of a barrier. Active24 is a veteran web hosting service that’s clearly done quite a bit to stay afloat in a competitive industry. They’ve got good deals for their customers and can accommodate a range of needs with their services. Wondering how Active24 stacks up against other Web Hosting companies? Enter any other Web Hosting company and we will give you a side-by-side comparison.